It forms part of a global day of action, consisting of over 400 separate events, organized to raise awareness of TTIP’s implications. A major concern is the trade deal’s power to strip nation states of crucial labor, environmental and consumer protections. The demonstration on Shepherds Bush Common will begin with an outdoor assembly, attended by a group of speakers who will address what they see as TTIP’s shortcomings. The campaigners will then depart from the West London park in a bid to target a group of yet-to-be announced TTIP backers from Britain’s corporate sector. 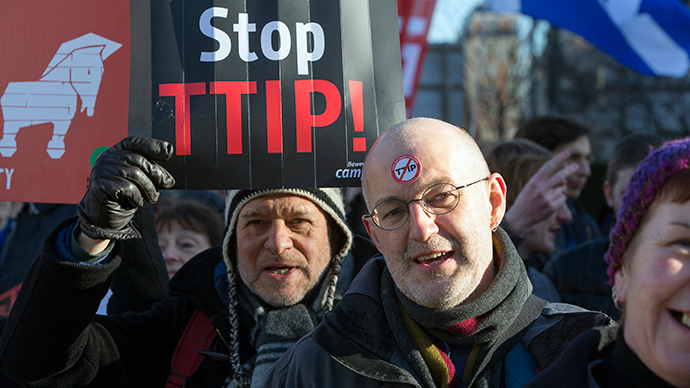 TTIP has been the subject of intensifying criticism of late both at home and abroad. In March, a Business, Innovation and Skills committee report condemned the government’s stance on the trade deal, and called for further evidence relating to its supposed positive impacts. TTIP has also been met with hostility across Europe, with a European Parliament (EP) vote on the deal recently being postponed after a draft resolution led to almost 900 proposed amendments. Trade campaigner for Global Justice Now, Guy Taylor, said the general election campaign is a key time for reflection on the potentially damaging impacts of TTIP. “Politicians promise so much to ordinary people in the UK, but what they would be able to do would be dramatically limited if TTIP was implemented and corporate interests are brought to bear on so many decisions of government,” he said.